I was recently graced with a review copy LIKE: Seven Rules and 10 Simple Steps for Social Media in Your Campaign by Kelly Groehler with Dave Ladd, Greg Swanholm, and Bass Zanjani. The book is available as both an e-book, hardcopy and has presences on Facebook and Twitter. The foreword is available as a free download at the bottom of this post. 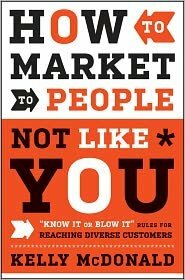 As the title suggests, “How To Market To People Not Like You” is all about understanding people who are very dissimilar from yourself. In my case, that would be the entire world, more or less. Author Kelly McDonald does an excellent job of opening your eyes to entire audiences you aren’t getting. In other words, increasing your business by expanding into new markets rather than increasing your existing one(s).